6 adjustable height settings to meet different height requirements, perfect to match your chairs, bed, and sofa. Two angle adjustments - flat/horizontal and angled, just tilt the table to an angled position and put the book right on its ledge, and protecting baffle can prevent the book, papers, laptop from falling. Perfect for a writing and gaming, reading book, playing computer in home, office. The C shape design can save large space, you can comfortably stretch your legs. Black MDF table tops , waterproof, durable and easy to clean. 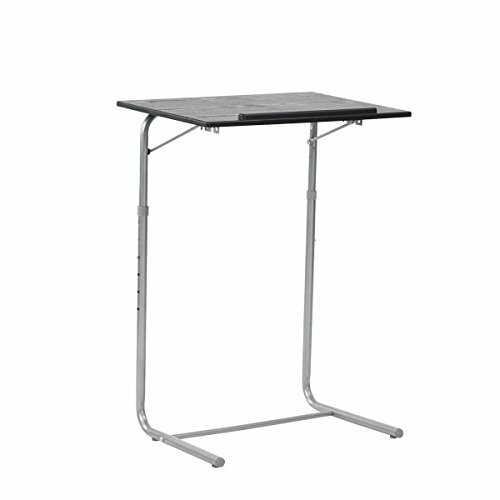 Powder-coated metal structure provides stronger support and make your laptop table more durable in daily use. Smooth table corners can avoid occasionally injury, safer in daily use. Wear-resisting foot pad prevent floor from scratch and noise. Ship from the UK, can be received within 5 days. Material: MDF desk top and black metal frame. Package Includes: 1 laptop desk, all the accessories, installation instruction. If any parts missing or damaged, please feel free to contact us at first time. We will reply within 24 hour. 6 adjustable height from 27.2-34.3inch, perfect to match your chairs, bed, and sofa. Two angle adjustments - flat/horizontal and angled. The protecting baffle can prevent the book, papers, laptop from falling. Perfect for writing, gaming, reading book, playing computer in home, office. Powder-coated metal structure, sturdy and durable; features black MDF desk top, easy to wipe clean. Dimensions: 20.9*15.7*27.2-34.3 inch(L*W*H). NW:7.5LB, light weight, easy to move and carry. If you have any questions about this product by Framodo, contact us by completing and submitting the form below. If you are looking for a specif part number, please include it with your message.